Mahesh Babu and Jr. NTR are the leading superstars of Telugu cinema. And we can imagine how their fans could go bonkers on seeing them together. So that’s what has happened! Fans of these two actors are going bonkers ever since they have seen Mahesh Babu and Jr. Tarak in one frame. The two actors happened to bond over at the party hosted by Maharashi director, Vamshi Paidipally. Maharshi Teaser: Mahesh Babu’s Journey As Rishi Kumar Is Highly Impressive! Watch Video. 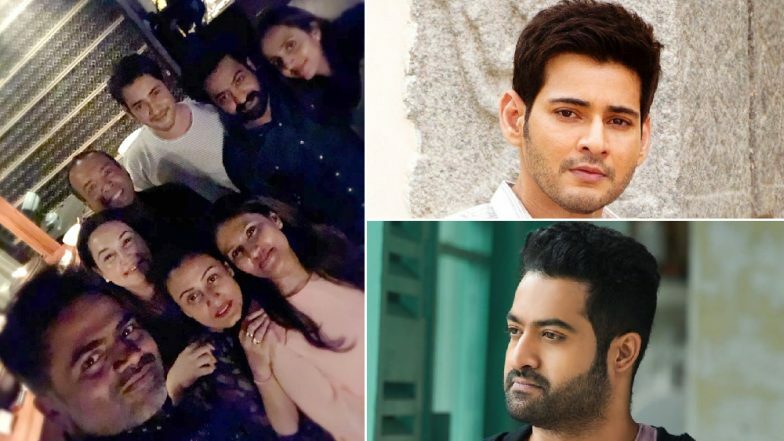 Vamshi Paidipally hosted birthday party for his wife Malini for which Mahesh Babu and Jr. NTR were seen in attendance along with their families. Mahesh’s wife Namrata Shirodkar shared pictures of the same on Instagram and captioned it, “Wishing my dear dear friend Malini paidipally a very happy birthday!! Her special big one #cozyevenings #closefriends #goodtimes.” Seeing the picture there were comments such as “Mb and Tarak in one frame, after 1 year”, “Jr ntrr... Anad mahesh anna”, “JAI NTR ...MB and NTR tollywood best brothers”, and more. Daisy Edgar Jones Reveals her Reason for Quitting SS Rajamouli's RRR Starring Jr NTR, Ram Charan and Alia Bhatt. On the work front, Mahesh Babu is gearing up for the release of his 25th film Maharshi in which he’s sharing screen space with Pooja Hegde and Allari Naresh. Meanwhile, Jr. NTR has started working on S.S. Rajamouli’s magnum opus RRR and in which he’ll be seen alongside Ram Charan. So do you guys wish to see Mahesh Babu and Jr. NTR doing a film together? Share your thoughts with us in the comment box below.